ZIC TOP, 0W-40 High Performance Engine Oil is designed to provide the ultimate protection for European, US and Japanese high performance and prestige engines, which operate & perform in severe conditions. API Group IV, Poly-Alpha-Olefin (PAO) stock coupled with high performance additives create the ultimate oil for modern high performance engines. 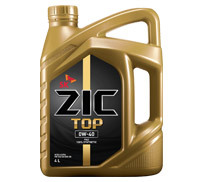 ZIC TOP, 0W-40 High Performance Engine Oil contains "Advanced Additive Technology" which has proven friction reduction up to 20% when compared to other Synthetic Engine Oils. High thermal stability and oxidation control reduces sludge and deposit formation providing optimum engine cleanliness which results in 5 times more service life of engine as compared to any conventional engine oil. Recommended for Gasoline/CNG/LPG/Ethernol Blended Fuel/Diesel High Speed Engines. Recommended for all EFI/GDI/VVTI/Hybride/Turbo/Super Charged/T-Intercollar Engines & Very High RPM Sports Engines.